Keep track of cocktail hour with this handsome cork catcher wall clock. A barrel stave inspired face and room for over 100 corks around the border add a playful touch to any space in your home. Over-sized roman numerals and black metal hands make it easy to ready from across the room. Easily add corks at the top, no need to remove from the wall. Batteries not included. How are the hands? So the keep time? The hands are black and enhance the beauty of the clock. Your question : So the keep time? If you are asking if the clock keeps accurate time, yes it does. The hands are rather light weight but clock keeps good time. Easy to set for adjusting to day light savings time & back. I love this clock!! Keeps perfect time and the hands are exactly how they appear in the picture. I love this clock. Keeping good time so far. Have only had for a month. Have had many compliments! Yes. It is battery operated. I have received many compliments on this clock. The clock has metal hands and keeps time very well. It is a nice clock! The clock is not a great time keeper, however, it is great for corks! I bought it as a gift. She said it was nice but I have not seen it. Yes, the clock keeps time well. Works great, easy, love it! BEST ANSWER: No, you add your own corks one bottle at a time! Fun process! The Cork Catcher Wall Clock does not come with corks. No, corks are not included. Approximately how many corks does it hold? BEST ANSWER: I don’t count the wine as i drink it but I will say 100-125. When it fills up, I empty it into other wine catchers I have and keep filling it. I’ve been saving corks for 6months and it’s not full. I open 1-2 bottles a wine a week. 100 wine corks or more. champagne corks are bigger and take up more space. How much does it weigh (approx)? BEST ANSWER: The Cork Catcher Wall Clock weighs approximately 10 pounds. I’d say 5lbs without any corks. Is it hallow on the back side? I would like to use it to cover a built in wall speaker. BEST ANSWER: The Cork Catcher Wall Clock takes one AA battery. It is just as pictured and a nice way to collect corks. It will take a lot of corks to fill it. It is a nice addition to my wine room. Very pleased with this clock! Gave as a gift to a friend that opened a wine bar. He filled the outside ring with corks, and it really looks stunning. Nice quality and would highly recommend!! Nice looking, fun adding the corks and the clock actually works. We initially had a couple of days when the clock stopped, repositioned it a little on the wall picture hook and 'all hands' now working fine. Sturdy. Nicely made clock and great for displaying corks. Is a conversation piece and have gotten quite a few compliments. Keeps accurate time and easy to read. We have it on our covered deck and it looks terrific. Seems to be working just fine. Easy to hang. Great accent to any large room. I love how unique this clock is. It adds an excellent dimension to any large room. We love it & have received so many compliments!! It is a very attractive and unique part of our dining room. 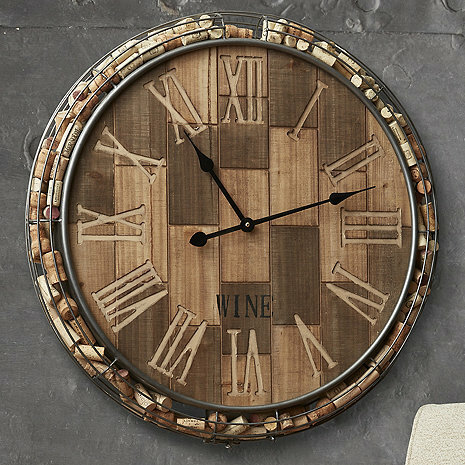 I love this clock and wine cork catcher. It fits perfectly in my living room and I get many compliments on it. Would definitely recommend this item. Even without the corks it still is a wonderful addition to my den and a real conversation piece. The different color woods give it a very unique look. Very nice and easy to load. My wife loves it. It fits nicely on the wall. Our clock did have some minor shipping damage to the "cork cage", but I was easily able to reshape the affected areas. This clock looks great by our bar! The clock was a Birthday gift for my sister, she loves it! I definitely recommend any gifts in your catalog for all occasions. I love my wine cork clock. It looks prefect over my fireplace. Looks FABULOUS!!!! Hanging it is super easy also. Very happy with this purchase!! Love it! Fits perfectly on my fireplace! Also got the side table that looks like a corkscrew & also holds corks. Clock looks great on our wall and is easy to hang. Fits right over our wine bar, and can be seen from almost anywhere in the living room. This is a nice product that looks great! The only downside I can say about it is the numbers are a little camouflaged and hard to read. We are talking about hand painting them darker, so the hours are more visible. The. Lock is a good size and will hold plenty of corks. First one shipped was broken, but customer service was great and replacement came out quickly. It keeps fairly good time given the small clock works. Overall, I’m pleased. Beautiful clock.. however the numbers are way to light.. blends in with the rest of the wood.. wire was bent on one side, but not terribly noticeable.. i plainted the numbers a darker brown and it looks nice. Overall a nice clock, but for the bent wire think it is a tab big overpriced. Nice clock, but some of the wires on one side are not symmetrical and slightly off. Too large and inconvenient to request an exchange. Looks good in the space though. Will look better with some corks. The clock was nice and true to it’s expectation, but I returned it because it was too bland on my wall, a light taupe color. I am still waiting for my refund. It would look great on a whitish wall. The hand finished ring holding corks was not uniform on either of the two clocks we received but once we got beyond this issue, I've got to say the clock shows very well and the uneven metal trim really adds to the rustic look of the piece. Recommended if you're comfortable with the rustic hand hewn look. Love the clock by it came with bent wire on one side. Tried to bend back. Not perfect but looks ok. Arrived with minor bends in the outer bars for the corks. Clock workings are very cheap. Took a fair amount of work to get the dials working as intended. Still uncertain about durability. The face and cork basket areas look great, so we didn't send it back (hoping that we can keep the clock operating). I was disappointed in the color of the metal frame - it is very light silver and the picture looks more like bronze. The numeric numbers are hard to read - they are not as picture shows - these should probably be done in some kind of metal. We will end up taking the frame off - spray painting it and try that - a lot of work for a new purchase.